Because of the compact size, keyboard (430 x 135 x 25 mm) will fit perfectly everywhere without any problems. 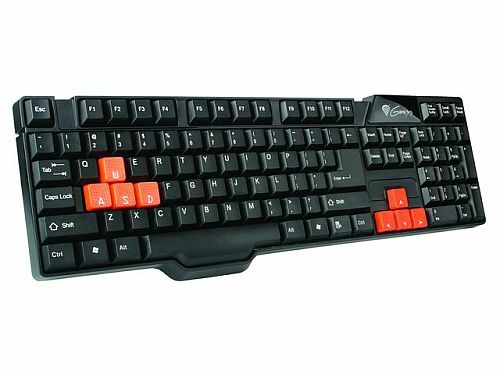 R11 Gaming Keyboard has stable construction, and its made with good quality materials. Despite the small site, device has classic keyboard setup, which significantly enhances comfort. 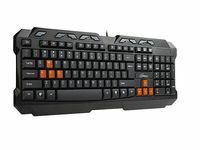 R11 keyboard has basic feature, thats important in every keyboard dedicated for gaming, instead of just typing good quality membrane keys. 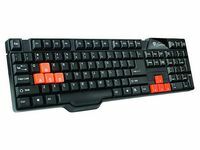 Most of office keyboards has poor quality keys mechanism, and that makes then not suitable for gaming. Genesis R11 uses high quality membrane, that gives long life to the keys up to 10 million pushes, therefore, its perfect for intense gaming. 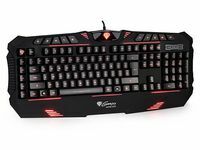 Moreover, keyboard has typical for gaming classic shape of keys, which helps to find proper key and keep finger on it without any slips. Its obvious for every active gamer, that WSAD and arrows keys are used frequently in gaming hence the included 8, additional keycaps for these keys. Rubberized surface and embossed inscriptions give longer life to the keys and substantially increases comfort of playing. Rapid wear of key inscriptions is one of the most frequent faults which appear on keyboards. To prevent that, Genesis R11 has protective layer on the keys (PU Coating), which protects inscriptions from being worn off.